Tripp is an 8-month-old mutt who loves going on walks. That’s normal for an active puppy, but what makes going on walks remarkable for Tripp is that he was born unable to use his front legs. Tripp is able to move his shoulders, although he is unable to move his front legs at and below the elbow area. They are permanently tucked under his belly. His left leg has one claw and “goes all the way down just really thin and brittle. This one cuts off a little bit before where his wrist would be,” Martin explained. Tripp wasn’t able to run and play like other dogs. Then in January, Tripp received the gift of mobility in the form of a wheel cart. 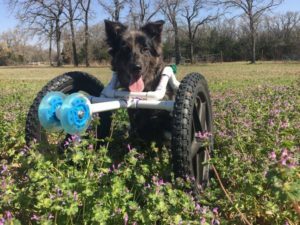 After eight months and a lot of research, Martin found Jerry West, a man from Burleson who made wheelchairs for dogs for free. She mentioned that out of the over 600 wheelchairs he has built, this is West’s second front leg chair. 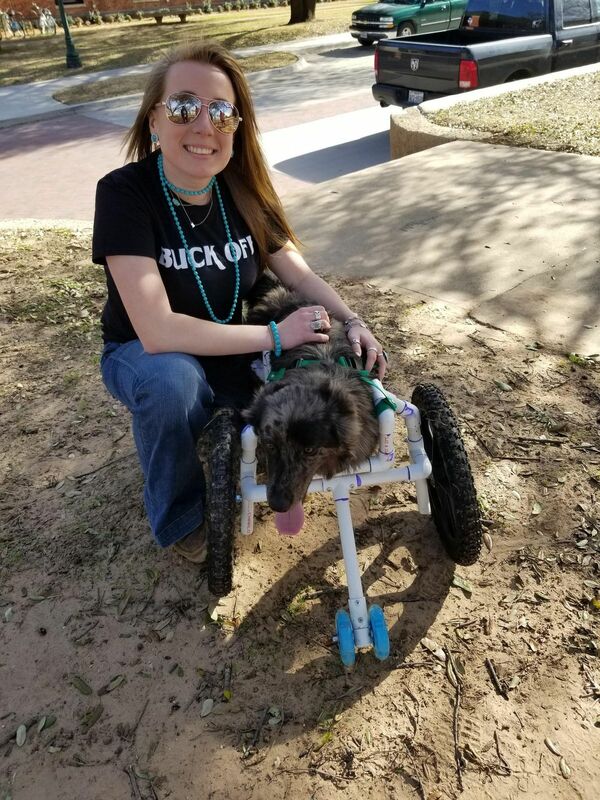 She made the hour-long drive from Stephenville to Burleson to pick up the finished version of the wheelchair. Tripp’s mother also had some minor deformities at birth. Martin explained that a veterinarian had said that the mother’s ovaries were messed up and that she wouldn’t be able to have puppies so there wasn’t any reason to get her fixed. “But five years later, she proved that vet wrong by having three puppies, all of which were deformed,” Martin said. Several factors can cause a dog to be born with a deformity, according to wagwalking.com. “Causes of front leg deformity can be injury, premature closure of the growth plate, or an inherited predisposition,” the website reported. The third factor appears to be what happened to Tripp. After a month in his new chair cart, Tripp was walking, running and playing with Martin’s other dogs — although they are still getting used to the contraption. Martin said he resembles a tank now compared with the other dogs. Tripp is still unable to do some things on his own because of the cart’s bulkiness and security. He needs help relieving himself on walks or eating or drinking. However, that doesn’t stop the puppy. Martin eventually plans to transfer Tripp from a wheelchair to prosthetics to give him easy access to running around and allow him to do more things than he is able to in the chair. “The only thing I really, really want him to work on is learning that he needs to slow down when he gets to where he needs to go,” Martin said.